This is the guiding document that embodies the vision of and use and development in the City of Nanaimo for the present and future - with goals such as: Managing Urban Growth, Protecting the Environment, Improving Mobility and Servicing and Building Complete Communities. This Official Community Plan (OCP) covers the rural communities of East Wellington, Pleasant Valley, Benson Meadows, Nanaimo Lakes, Extension. It outlines a comprehensive set of policies and guidelines for managing existing and future uses of land, in a manner that preserves the natural amenities and rural character. This report provides a comprehensive analysis of the District of Lantzville's water supply and distribution system, and projects future requirements. This plan sets a long-term direction and strategy for water supply decision-making for the City of Nanaimo on a 50 year horizon to the year 2055. This strategy describes a number of actions that can be considered, developed and executed by the City to conserve water and reduce demand, and sets goals for reducing water consumption. Located in Lantzville on Harby Road, this well monitors groundwater levels in surficial sand and gravel aquifer 215. Established in 1979. Located in the Benson Meadows area just outside the City of Nanaimo, this well monitors groundwater levels in bedrock aquifer 211. It was established in 2010. Part of the RDN Community Watershed Monitoring Network, monitored by Island Waters Fly Fishers. At Biggs Road; part of the RDN Community Watershed Monitoring Network. Monitored by Island Waters Fly Fishers. At Barsby Park, just upstream of Maffeo Sutton Park. Part of the RDN Community Watershed Monitoring Network, monitored by Island Waters Fly Fishers. At East Wellington Road, part of the RDN Community Watershed Monitoring Network. Monitored by the Island Waters Fly Fishers. At Park Ave, part of the RDN Community Watershed Monitoring Network. Monitored by VIU Fisheries and Aquaculture. Part of the RDN Watershed Monitoring Network, monitored by VIU Fisheries and Aquaculture. At Aebig Road, part of the RDN Community Watershed Monitoring Network. Monitored by VIU Fisheries and Aquaculture. The Water Survey of Canada tracks stream flow and level in real-time at this site (08HB032) in the lower Millstone River. Joseph Creek at Neyland Rd. Departure Creek at Newton Rd. This is part of the RDN Community Watershed Network, monitored by Departure Creek Streamkeepers. On Feb. 22, 2016 the Irrigation Industry Association of BC is hosting training course for irrigation contractors to learn about the installation and maintenance of efficient irrigation systems. 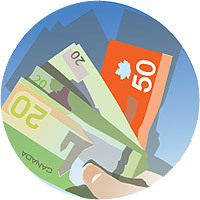 For professionals and companies that operate in the Regional District of Nanaimo and/or member municipalities, a $100 subsidy is available. Team WaterSmart presents: Water Day 2016 in Nanaimo! Sunday, March 20th, 10 a.m. - 5 p.m. at the Bowen Park Complex. This family-friendly event has something for everyone - workshops, speakers, interactive display booths, kids activities, live music and food concession - in a day all about our most precious resource: water! There is rural residential, farm land and park in the middle water region and the upper water region is predominantly forestry land. There is significant spread of farm-related land uses in the middle of this water region. The RDN has an Agriculture Area Plan that contains a regional strategy for sustainable farming and related land uses. Most people in this Water Region live in the City of Nanaimo , and they get their drinking water supply from the upper Nanaimo River watershed - from the South Fork dam and Jump Lake dam. District of Lantzville residents in lower Lantzville are supplied groundwater from the district's community wells. Outside of City limits, electoral area residents supply their own water from private wells (indicated by the pink dots on the map). Upper Lantzville residents are also on private wells. The RDN wellSMART program provides information on private wells. In this water region, there are bedrock aquifers and sand and gravel aquifers that are the main source of drinking water in the areas outside the municipality of Nanaimo. Aquifers are underground areas that store water, either in bedrock fractures or in the pore space between sand and gravel. This includes provincially mapped aquifers 211, 213 (bedrock) and aquifers 167, 215 (sand and gravel). (#232) in Lantzville on Harby Road that monitors water levels in surficial sand and gravel aquifer 215. (#388) in Benson Meadows just outside Nanaimo that monitors water levels in bedrock aquifer 211. This water region includes the Millstone River and Chase River, as well as some rural creeks: Benson Creek, Beck Creek, McGarrigle Creek. Brannen Lake is the headwaters of the Millstone River, and Westwood Lake also drains into the Millstone. Mount Benson is the highest elevation in this water region. There are several other smaller lakes in this water region, including Green Lake, Long Lake and Diver Lake. The most notable wetland is Buttertubs Marsh . There are also several urban streams in this water region, as it comprises the City of Nanaimo: Departure Creek, Cottle Creek , Northfield Creek, Cat Stream, Knarston Creek (in Lantzville). All of these waterways drain into the Salish Sea at the Strait of Georgia. In a City, when rain falls, it hits the pavement and is quickly rushed into the nearest storm drain. Along the way, it picks up harmful chemicals such as oil from cars, rubber from tires, and even garbage.In the City, it is particularly important that we take care to limit paved surfaces on our properties where possible, and remember that anything we put down a storm drain ends up in a river. Key stewardship groups that are active in this region include: the Island Waters Fly Fishers, the Departure Creek Streamkeepers, and Vancouver Island University Students and Environmental Groups. Streamflow is monitored a Water Survey of Canada hydrometric gauge in the lower Millstone River at Nanaimo. This water region is within the traditional territories of the Snaw-naw-as or Nanoose First Nation and the Snuneymuxw First Nation . This area is rich with cultural significance and the waters and lands are closely connected with First Nations peoples and their ancestors.